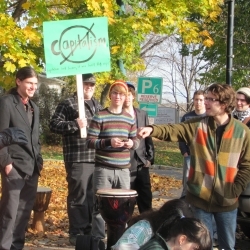 EDMUNDSTON, NB—The Occupy movement has spread to the small, francophone city of Edmundston, in northern New Brunswick. Occupations of public spaces have been ongoing since October 15 in cities across North America, but many smaller cities and towns have now joined in. Around 50 people, mostly students but also workers and retirees, demonstrated in front of Edmundston City Hall on October 29. "I'm here today because of social and economic inequality," said Nicole Ouellet, a caregiver for the elderly who is making the same salary today in Edmundston that she made 30 years ago in Montreal. "Food prices are going up all the time but not our salaries," remarked Ouellet. At an age when she should be planning her retirement and enjoying time with her grandchildren, Ouellet has gone back to work in caregiving, a sector traditionally dominated by women that is today considered underpaid by pay equity advocates. Caregivers like Ouellet and her male co-worker, who also participated in Occupons Edmundston, would benefit from long-awaited pay equity legislation in the province. Pay equity is equal pay for work of equal or comparable value. Skill, responsibility, effort and working conditions are factors long ignored in jobs predominately done by women. "My husband must work in Alberta. One of our kids is forced to work outside the province. We wish we could live near our kids so that we could get to know our grandkids," said Ouellet. France Ritchie, a friend of Ouellet's, said, "They take $30 away from the poor all the time instead of ending the war. I'm old enough so it doesn't affect me to protest. A lot of people are afraid to lose their jobs or their reputation and that's why they're not out in the streets. We're here to support the people occupying Wall Street. We will not take it anymore. It started in Egypt. I knew it was only a matter of time before it spread here." André Charest, who came out because his 15-year-old son, Emmanuel, felt it important to attend, said, "I'm against the model we have. The majority pays while a minority puts it in their pockets." The father and son held signs that conveyed this message. They were greeted with many honks of support from passing motorists. "I may be young but I'm going to feel the consequences," said Emmanuel. The majority of the people who participated in the Occupons Edmundston protest were students from the Edmundston campus of Université de Moncton. They sang protest songs that warmed the crowd during what was a chilly October afternoon. Two targets of protest have appeared at most Occupy sites: one being corporate greed and the banks, with the other being the system, namely capitalism. Opponents of the latter target argue that equality will not result from tweaking the system, regulating the banks or policy reform. They point out that the oppression of workers and crises are inherent to capitalism. The latest crisis, its effect on workers, and now the Occupy movement have created opportunities to question capitalism and discuss another form of economic and social relations where in which every worker is able to control their lives and realize their full potential, dreams and capacities. "I'm here to protest against capitalism," said Sebastien Levesque, one of the university students studying philosophy, politics and history. "It's an important contemporary problem. The system is destroying everything including the environment." Étienne Rousseau, another university student, who held a sign with the popular Occupy slogan, "Capitalism isn't broken, it was built that way," agreed with Levesque. "I hate the system. The rich are getting richer and the poor poorer. It's expensive to study right now. We are the next generation. We have to do something," said Rousseau. Dominic Duval, an arts and social sciences student, organized Occupons Edmundston after waiting for someone to organize it and no one did. "The Occupy movement has spread to over 80 countries and 1,600 cities. It is important for Edmundston to do its part. We don't want to promote the status quo. We want change. We need change," said Duval. Nicole Ouellet said the Fraser Papers' pensioners in Edmundston who lost about 35 per cent of the benefits in their pensions are part of their movement. When Fraser Papers received protection under the Companies’ Creditors Arrangement Act in 2009, Brookfield Asset Management, its controlling shareholder, sold part of the company to itself and divested itself of pension obligations for all their pensioners and current workers. Brookfield Asset Management, with former New Brunswick Premier Frank McKenna on its board, came under fire recently at the original Occupy Wall Street location for threatening to evict Occupy participants in Zucotti Park. Brookfield owns Zucotti Park. The company had called for protesters to be removed so that it could clean the park, but its efforts were unsuccessful and the occupation continues. Like Nicole Ouellet, some of the pensioners have been forced to return to work to pay the bills. In an open letter published October 27, Jacques Sarlabous, a Fraser Papers' mill pensioner, said he sent 134 resumes over a five month period and got three part-time jobs at minimum wage. Sarlabous said he had to take the jobs because he and his wife suffer from serious health conditions that require costly medications. Sarlabous wrote, "I worked at the Fraser Papers' mill in Edmundston, New Brunswick, for 36 years. On each pay cheque, I contributed a portion of my wages to the pension fund, which I believed would be a guaranteed investment. In 2009, with talks of a potential bankruptcy at Fraser, I decided to withdraw my pension plan with the aim of securing my assets. I signed documents and withdrew the first pension payment that I was entitled to. Unfortunately, I was able to benefit from my full pension for only three months. Having given 36 years of my life to Fraser Papers, I got a full pension for three months. In other words, one month of pension for every 10 years of service!" Edmundston pensioners were among the first to participate in Occupy actions in Canada. 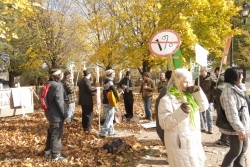 Organized as the Victims of Brookfield Association, with a membership of 800 retirees, four Edmundston pensioners and two Thurso, Quebec, pensioners participated in Occupy Toronto and demonstrated in front of the Toronto offices of Brookfield Asset Management on October 15. They shared their stories of losing their hard-earned pensions. It's not the first time that the pensioners occupied Brookfield Asset Management's head offices in Toronto. On January 2010, union leader Gaétan Ménard and Fraser Papers’ pensioners occupied the company's office. According to the Communications, Energy and Paperworkers' Union, the union representing the pensioners and workers, Brookfield CEO Bruce Flatt was “not concerned” that pensioners could lose 40 per cent of their pensions as a result of the company’s restructuring plan. A year later, the pensioners and union leaders occupied the office again in an attempt to have the company reinstate the workers' pensions. The workers were escorted out of the office both times. "Why the Occupy movement? Because too many laws in this country are about protecting big corporations, not workers," wrote Sarlabous. Tracy Glynn gets to bash capitalism as a PhD student at the University of New Brunswick. She does reporting for the New Brunswick Media Co-op, where this article was originally posted.